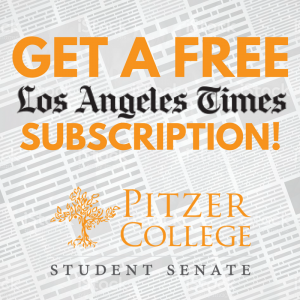 During the 2016-17 academic year, Pitzer College piloted a new partnership between the Pitzer College Student Senate and the Los Angeles Times! For the first time ever, students of Pitzer College were eligible for a complimentary digital subscription to the Los Angeles Times, with full digital access to one of the most critically-acclaimed newspapers in the country. This partnership was part of the ongoing efforts of the Student Senate to empower students to be more engaged and conscious members of our society. It is important for us to know what’s going on, around California and across the globe. data covering local trends, crime, and demographics. a 24/7 study and research tool on topics most relevant to your courses and interests. exclusive premium storytelling from our trusted columnists and writers. essential California Newsletter delivered to your inbox daily. Indie Focus: advance screenings of up-and-coming independent films. series of events and tastings that highlight the diverse cuisines of Los Angeles. Signing up for your complimentary digital subscription to the Los Angeles Times is easy and can be done here: www.latimes.com/pitzercollege. For more information, email senate@pitzer.edu.